More than 30 years have passed since The Catalina News magazine started and I am now writing about surviving Catalinas that are at least 74 years old, some a little older. There is still plenty to report too! Remember that you can get our fully illustrated magazine of which this article is just a small part by joining The Catalina Society – see our website for joining details. One question that our crews are frequently asked at air shows is “how many Catalinas are still flying?”. The answer of course depends on how you define airworthy – my general rule of thumb is any aircraft that has flown in the last year or so but I accept that is fairly arbitrary and excludes aircraft that could fly but have not done so lately. My current figure is 15 and they are distributed as follows: Australia – one (VH-PBZ); Canada – four (C-FNJE, C-FPQL, C-FPQM and C-FUAW; UK – one (G-PBYA); France – one (N9767); Netherlands – one (PH-PBY); New Zealand – one (ZK-PBY); USA – six (N206M, NX2172N, N222FT, N4NC, N427CV and N9521C). However, the figure for the USA could be overstated by as many as three as N206M, N222FT and N4NC may not have flown recently. In addition, PH-PBY in the Netherlands is temporarily un-airworthy after its recent nosewheel-up landing at Lelystad. So, the position is fluid but encouraging – the list recently increased by one when C-FNJE took to the air again in Canada and N315KM in Greece may take to the air again soon after a long period on the ground. More detail on all these survivors as well as the many static exhibits and substantial relics around the world can be found at our website www.catalina,org.uk – just look for the ‘Survivors’ tab. This list is updated after the publication of each issue of The Catalina News. One word of explanation that applies both to the listing and this column – for reasons of consistency, unless noted to the contrary, I tend to refer to individual aircraft by their designation at the time of construction. So, for example, all the aircraft mentioned in the Canadian news items below are referred to as ‘Cansos’ as that was what they were when they were built and entered service. 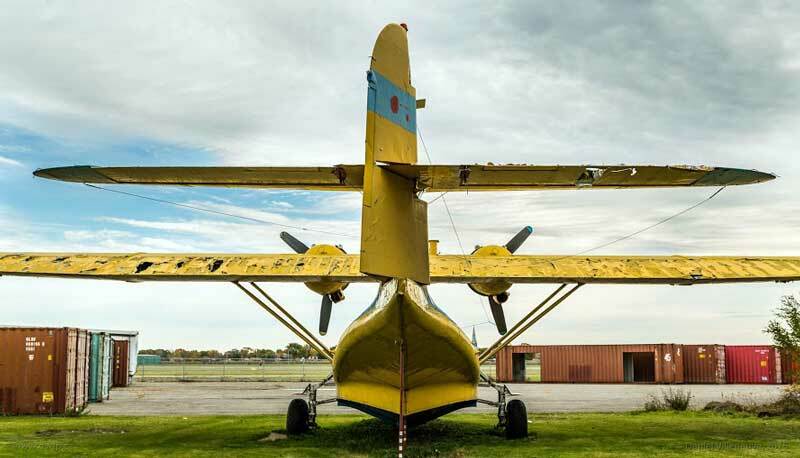 There is lots of good news from Canada this time around, all involving former fire-fighting aircraft which just proves that the preservation movement has a lot to thank the water bombing industry for! Until recently the airworthy population of Catalinas and Cansos in the country was just one, that being Canso A C-FPQL of the Canadian Warplane Heritage at Mount Hope, Ontario and even that was grounded for a while not so long ago. Now, there are no less than four, all ex-RCAF Canso As. Perhaps the biggest news concerns Canso A C-FNJE which returned to the air at Fairview, Alberta in mid-June this year. Since then it has attended a few shows in Canada and its owners must be congratulated on getting it flying again. See the story of its restoration elsewhere in this edition. Another Canso A, C-FPQM, has flown again recently after something of a hiatus since its last flight in July 2015. Acquired by Patrick White from Buffalo Airways some years ago, it had originally been intended to make a commemorative flight from Newfoundland to Foynes in Ireland back in 2007 but this did not happen and ‘QM remained in store at Gander where it is still based. Now registered to Pat’s company Exploits Valley Air Services Ltd (EVAS), it flew again in early-July this year and appeared at the Norris Arm Flying Boat Festival in the harbour at Botwood some 40 miles from Gander. Pat and his son Ian, a current CL-415T water bomber pilot, intend to fly ‘QM on a regular basis to keep it in good trim and at present it is still equipped for water bombing should any forest fire-fighting work come their way. The airframe still carries the red and yellow livery and tanker code ‘714’ it wore with Buffalo Airways but a recent addition is EVAS titling below the horizontal tail surfaces. Although the 2007 trip did not happen, it is hoped that a European tour may still be undertaken at some point. On the west coast of Canada, Canso A C-FUAW has been active at a number of shows this year which is very encouraging. Like C-FPQM, it was a waterbomber, latterly with Buffalo Airways, until acquired by well-known Canadian Canso pilot Bob Dyck of Pacific Flying Boats Ltd in late-2010. Since then, and as previously reported in World Catalina News, it has been overhauled, had a superb set of blisters placed back on the rear hull and painted in its original RCAF colours as 11024/K. It first flew with the blisters in place on May 13th this year. This summer it has been seen at several shows in the Pacific northwest including those at Boundary Bay Airport, Delta, BC on July 22nd, the SeaFair show at the Museum of Flight, Seattle, Washington during the first weekend of August and the Vintage Aircraft Weekend at Paine Field, WA at the beginning of September. It also appeared at the US Navy Air Station at Whidbey Island, also in Washington State, in June. During the season, C-FUAW has acquired some very attractive nose-art in the form of a Canada Goose adorned with a ‘female form’ and the name Shady Lady. The aforementioned C-FPQL of Canadian Warplane Heritage has been active this summer too. It has recently had a new emergency exit, very similar to that on our Miss Pick Up, installed on the port side of the forward hull. In addition to a few passenger flights under the CWH rides scheme, it has also visited events at various locations in Ontario including the Community Charity Airshow at Brantford, Owen Sound’s Wings and Wheels display and the early September show at its home base of Mount Hope, Hamilton. Updating an item in our last edition of World Catalina News, the Canso A C-FPQK that was acquired by the Collings Foundation and registered as N983CF has now left its long-term home at St Hubert in Quebec. Having been dismantled, it left by road on June 12th for the American Aero Services facility at New Smyrna Beach, Florida where it will be rebuilt over time. American Aero Services now has two complete Catalinas/Cansos at its Florida base together with substantial parts of a third. In addition to C-FPQK mentioned above, it is rebuilding the PBY-5A N287 for the Cavanaugh Flight Museum of Addison, TX (see last issue) and the wings of PBY-6A N7057C for the American Airpower Museum at Farmingdale, New York. The Erickson Aircraft Collection based at Madras, Oregon owns yet another ex-fire-fighting Catalina, PBY-5A NX2172N, which is a fairly frequent flyer. A recent announcement on the collection’s website stated that it will soon be possible to take a ride in the aircraft as part of its ‘Soaring with the Warbirds’ programme. Twenty-minute flights are on offer for an as yet unstated price. The programme already includes a number of other WWII aircraft. Now to Europe. Earlier this year, the Canso A N9767 based at Melun-Villaroche, south-east of Paris was put up for sale. An advertisement on Barnstormers.com stated “PBY-5A Catalina for sale $550,000. Nice licensed and flying PBY Canso, 12,900+hrsTT, engines PW 1830-92s both low tome since O/H, props the same. Recently used in the movie The Odyssey (the life of Jacques Cousteau). Nice interior, radios the usual King stuff, dual KX155s ILS/VOR loc, KT76A w encoder, dual King ADFs, switch panel and intercom – most of it works. This aircraft has WWII history, the one (! – Ed.) that sank a U-boat.” A quick check in mid-September showed that the aircraft was no longer being advertised but it does still appear on the website of the organisation France’s Flying Warbirds as part of their fleet. Although not a frequent flyer, it was displayed in the static park at this year’s Paris Air Show, still in the colour scheme it wore in the Cousteau biopic. In Norway, the restoration of the former-Royal Danish Air Force PBY-5A Catalina L-857 to represent the Royal Norwegian Air Force aircraft ‘48382’ was mentioned in our last issue. To mark the completion of its restoration, a celebration was held at the Flyhistorisk Museum at Sola, Stavanger on August 29th. The transformation of this aeroplane from a neglected hulk in Denmark to a beautiful museum exhibit is remarkable and the result of many years of work. More on this in Issue 89. The Athenian Aviators Collection Canso A N315KM edges ever closer to flight from its base at Tatoi in Greece and it is now paperwork rather than technical issues that is keeping it ground-bound. Hopefully, by the time of our next edition, she will have taken to the air. When it does fly it will be a great tribute to Minos Kyriakou, creator and founder of the collection who passed away unexpectedly in July. Finally, the neglected PBY-6A HK-2115X/P in Colombia appeared for sale on eBay in September with an asking price of $500,000, demonstrating that its unidentified German owner is either an optimist or has a sense of humour – maybe both?